BBC NEWS | UK | Magazine | What happened to the Branscombe booty? What happened to the Branscombe booty? 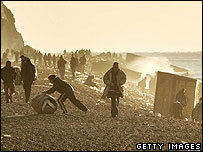 Teams of cleaners have been removing debris from the beach. A year on, the MSC Napoli still casts a shadow over Branscombe - literally. When the container ship ran aground off the coast of Branscombe, the villagers could not have predicted what the wreck would bring them. Crates washed from the stricken vessel delivered BMW motorbikes, pet food, anti-wrinkle cream, empty wine barrels, copies of the Bible in Xhosa - and a horde of scavengers eager for booty. Most were disappointed. Only 17 motorbikes - by far the most valuable item of cargo - came ashore, and most beachcombers could only fill their pockets with soggy cosmetics. But contrary to portrayals of them as lawless looters, the Receiver of Wreck has been informed, as the law requires, of the whereabouts of 13 of the bikes. Two undocumented bikes have been seized in a police raid and a further two are unaccounted for. Jack Pyne, 23, a bar manager from nearby Sidmouth, is one of the handful to come away with a bike, shared with two friends. After hearing about the Napoli on the local news, they went down to Branscombe out of nothing more than curiosity. "There was a crowd around the container and someone said, 'Help everyone else and you'll get one too'. "I didn't go down there with the intention of stealing anything and I wouldn't have taken the bike if the policeman on the beach hadn't said it was OK. I've filled in all the forms and done everything by the book." If he is given the all-clear to keep the bike, Jack hopes to sell it for about £5,000 ("it is second hand, after all"), after replacing several parts to make it road-legal in the UK - the vehicle having been built for the South African market. 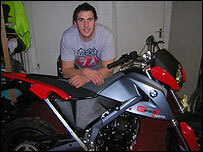 BMW says it wants the bikes back, but the scavengers have turned down the £260 it has offered them for each vehicle. The company says the motorbikes are not roadworthy because of damage from seawater. But Jack, who has stored the bike in a secret hiding place, retorts: "I know it works because I had a go on it down on the beach - there was a tiny amount of petrol in the tank." Jim Newton, 37, from Beer, the next village along from Branscombe, rowed out to fetch back six wooden barrels - destined for a South African vineyard - which were floating in the sea. He kept two for himself - one of which he has fitted with chairs and converted into a table for his garden - and gave the rest away to neighbours. "Everyone talked about how much they were worth, but I didn't have any intention of selling them," Jim says. 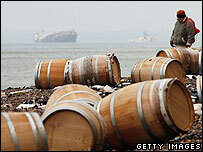 "They were in excellent condition, and if we hadn't taken them away they would have just ended up as landfill. "The Napoli caused a lot of disruption, but at the end of the day it put this area on the map. It's been good for the local tourist trade." One trader who has made the most of the wreck is Julian Temperley of the Somerset Distillery, 20 miles across the county boundary. Julian was not a scavenger himself. 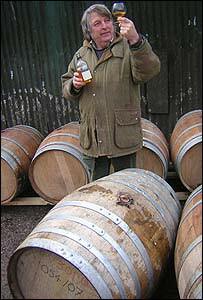 But he paid those who were between £60 and £100 each for 18 barrels, in which he matures 10-year-old cider brandy - labelled Shipwreck, and selling for £28 a bottle. He admits that his attempts to profit from the Napoli's fate has not been universally well-received in the area. "There are some pompous gits who say it shouldn't be allowed, that it's vandalism," he says. "But wrecking is a great West country tradition. "The Napoli is a great story, a modern-day Whisky Galore. People will talk about it for years. We should be making the most of it." But Anita Bokdal and her husband Jan were horrified to see their crate being ransacked on the television news as they sat at home in South Africa. They watched as items worth more than £47,000, and of huge sentimental value, were plundered. Twelve months on, she estimates only about 2% has been recovered. Pictures embroidered by her late father-in-law and most of a fine bone china tea set - a wedding present to her in-laws - are still missing. "Some things were only available in our hearts, it's very sad," she says. "We still cry about those copper trays and embroidered paintings. It's like we lost our parents for a second time. It's unbelievable how much it hurt in our hearts that people do things like that." 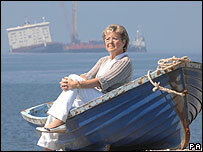 She received a small insurance payout but hopes to get a sum from the shipping company. And she's fulsome in her praise of the villagers who welcomed her on a visit back to the beach last May. 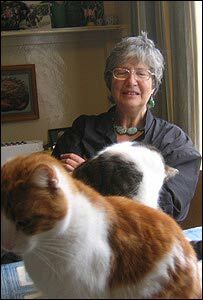 Barbara Farquharson, 68, a retired archaeology professor whose home overlooks Branscombe beach, took two bags of catfood from the beach - both of which she fed to pet felines Mackerel and Conkers. "The authorities told us it would be inedible because of the seawater," she laughs. "But the cats seemed to enjoy it. "There were very different opinions within the village about the scavenging. Some argued that if you found sixpence on the beach and took it away, that would be theft. Others said it was legal, so what's the problem? "I felt that after all the chaos that we endured, a few bags of catfood each was the least we deserved." Other scavengers insist they were good Samaritans. Tom Coombs, 42, an IT worker from Seaton, Devon, found an oil painting on the beach. He cleaned it up and sent photographs to the Receiver of Wreck - who reunited the artwork with its delighted owner. Tom says he is typical of those who visited Branscombe in the wake of the Napoli. "The papers all said everyone was down there to grab whatever they could for themselves, but I think most people just came because they were curious. "I had no intention whatsoever of keeping the painting, I just thought it would be ruined if it had been left where it was and that would have been a shame. I'm glad it's back with its rightful owner now - that's all I ever wanted to see." While I have no particular view on the rights and wrongs, I did find the television coverage very interesting. Early reports painted the "beachcombers" as a cheeky bunch who were doing nothing other than following an old West country custom. Twenty four hours later and they were "scavengers" who were reaping untold shame upon their community. I wonder what caused the shift in reporting - did someone eventually do some research and discover this jolly jape was actually illegal? If there was a policeman on the beach, he presumably saw the Bokdals' property being stolen. While one officer couldn't stop the looting, surely he could have noted what happened so the serious thefts (ie not catfood) could be investigated later. Plus it was filmed. It is outrageous that their property could be stolen in broad daylight with plenty of witnesses and nothing be done about it. My heart goes out to Jan and Anita Bodkal, and I can only hope that they recover the rest of the family items they have lost. I would hate to think that anyone has recovered their possessions and is deliberately refusing to return them. Other than that though, I say good luck and well done to all ye Merrie Salvagers who made such good use of the recovered cargo. The law against keeping shipwrecked goods is to prevent people luring ships to their ruin, since that does not apply anymore, and the goods will be ruined by the sea if left there, anything swept to shore should be finders keepers. It was stealing plain and simple, and those who went down to that beach should be ashamed of themselves. The police who were there should of arrested people looting. They're no better than people who loot shops and steal when there is a riot. I can't imagine those who were scavenging would be quite so keen if their goods had been washed up in, say, South America or Malaysia, and they were watching other people profiting from their things. Do unto others as you would they do unto you, as one of the many holy books exhorts us. Taking items washed up from wrecks is an old practice - however the people who did this in the past were poor and possibly hungry. These days the concept of greed seems to be a good thing. I don't know if I would have been tempted had I been there. I hope not but will never know. The behaviour of the "scavengers" only goes to illustrate the general state that this country has fallen into. People seem to expect everything to be given to them for free and justify it by saying that it is the property of big corporations who can afford to loose items. Perhaps these "scavengers" might have a different attitude if a burglar walked into their home and helped themselves to their property. It's true, plundering shipwrecks is an old West country tradition (200 years ago it may have been OK) and normally most people have no problem with keeping items found on a beach. However this shipwreck is different in as much as the beachcombers were stealing personal items where the owner is known and the items could have been returned, causing them great distress. It was a disgraceful display of greed and the police should have been there to stop it and also to ensure any stolen goods were retrieved. I cannot understand the "stealing" comments. The story clearly indicates that most goods of any worth were recorded and reported. What this means is that those people prevented your tax money from paying for a clean-up operation where all of these things would have been declared junk and tossed in a landfill. It is better the goods are recovered and used, returned, or re-sold. Theft has a legal definition and whilst you may question the morality of (some of) the actions, provided items removed are reported to the Receiver of the Wreck, my understanding is that their actions are perfectly legal.